NEW YORK--(BUSINESS WIRE)--For 2019, almost all medical plan trends for both active employees and retirees under age 65 are projected to be lower than 2018 projections. (Fee-for-service/indemnity plans are the exception.) 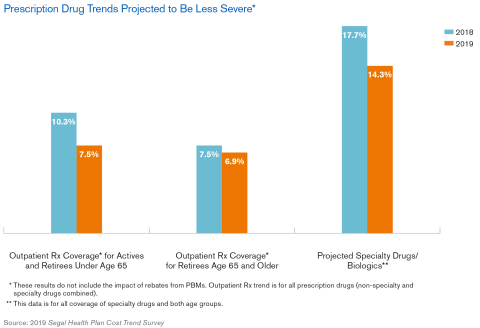 Prescription drug cost trends, which have dropped significantly in the last several years, are also projected to be lower. Those are among the key findings of the 2019 Segal Health Plan Cost Trend Survey. Prescription drug trend is no longer at double digits and is now close to medical cost trend rates. However, specialty drugs, which account for more than one-third of total pharmacy spending, are still trending at a double-digit rate. 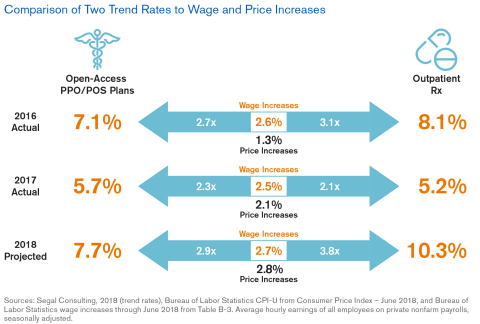 The leading driver of trend increases for physician services, hospital services and prescription drugs continues to be price inflation, not utilization. Another factor influencing trends is the network-negotiated reimbursement rates paid to providers. Those rates differ from price inflation. Changes in provider reimbursement rates are the result of negotiations between provider groups and health care systems. The survey respondents reported actual medical and prescription drug trend results for 2017 (the most recent full year for which actual data is available) that were significantly lower than carrier projections for 2017. In fact, actual prescription drug plan cost trend for 2017 was the second lowest in the last 13 years. “Although the slowdown in prescription drug plan cost trends is undeniably good news for plan sponsors, their continued focus on managing that significant expense is appropriate. Prescription drugs account for 20 to 25 percent of plans’ annual expenditures,” comments Eileen Flick, senior vice president and Director of Health Technical Services at Segal. The gap between projected and actual trends for open-access preferred provider organizations/point-of-service plans, which had been closing since 2014, widened in 2017. Projected prescription drug trend, which had been rising since 2014, increased slightly between 2016 and 2017, while actual trend was dramatically lower. The fact that three of the top five strategies focus on prescription drugs is not surprising given that prescription drug trends outpace medical trends. This is the 22nd year of Segal’s survey of managed care organizations, health insurers, pharmacy benefit managers and third-party administrators. The survey respondents reported trend forecasts for medical, prescription drug, dental and vision coverage. To speak with a consultant about health plan cost trends, please contact me.